If you have one or two flies in your home, you probably have a good idea how to control them. All you really need is a fly swatter and good aim! However, if house flies have become a daily problem, there is a good chance that you are not taking the proper precautions to prevent them. 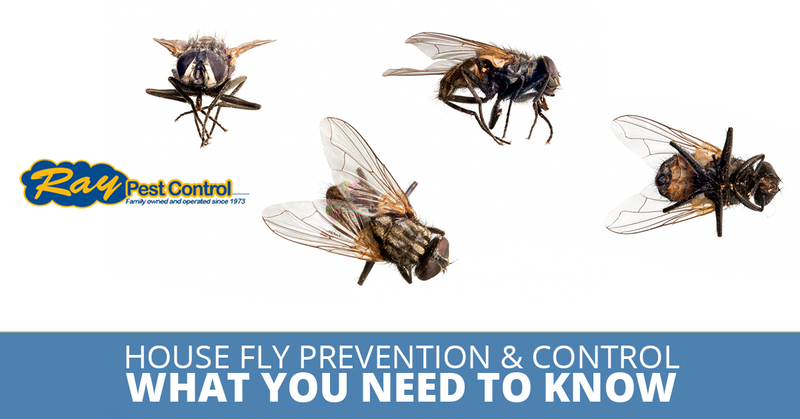 House flies are a nuisance that can also carry disease and infect your food, so it is in your best interest to take housefly prevention steps now, as well as address any current infestation. When you are doing with any type of pest, the most efficient and effective solution is to call Ray Pest Control for an exterminator in Piedmont. We have years of experience in controlling these pesky insects, and can help you in such a way that you cannot help yourself. In the meantime, here are some steps you can take to begin getting your house fly infestation under control. In order to control house flies, the first step is to understand where they are coming from. Before you put anything in place, you need to locate the source and why they have chosen your home. Inspect your home to determine where the flies are getting in, and this will enlighten you as to how to proceed. Keep a lid on all trash cans and remove it from your home frequently. Promptly address spills and keep shelf-staple foods covered. Regularly clean any feeding or litter areas for your pets. Quickly address any drips and reduce excess moisture. Ensuring your window and door screens are intact. Close all doors, vents, and windows when you aren’t using them. Caulk and cover all possible entries to your home, such as cracks, holes, and the areas around vents, doors, and windows. Plug any weep holes with pieces of window screening, scouring pads, or nylon. Fly swatters can help eliminate a small number of flies. Make sure not to swat flies near food, as the splatter can get into the food. Fly traps may also help. You can use sticky fly ribbons or papers to trap flies. These traps use an odor to attract flies to them, capturing them by making them stick. You can also create your own fly traps with bait. Good bait for flies includes fruit, molasses, sugar or meat. There are also pre-baited traps that often use fly pheromones to attract them. There are also ultraviolet light traps, which can be effective, but must be place in the proper location. They need to be placed where they cannot be seen from outside, as this could attract flies from outside in. Additionally, they should not be placed more than five feet off the floor, as that is where most flies fly. Finally, they should not be placed in any food preparation areas or where they compete with other light sources. Place strips that release pesticide in areas that are unoccupied by humans. Use contact aerosols to kill flies when you see them. This is only a temporary solution. Spray a residual insecticide for flies around your doors and windows, as well as any other entry points. When you are looking for a foolproof way to control houseflies, it’s best to call Ray Pest Control for an exterminator in Winston-Salem. We have all the tools and know-how necessary to address your housefly concerns.